Mornings used to be a dreaded time of day for me because I just seem to get my wind and my energy later when everyone else seems to be winding down. I think it is because it is quiet, and I function best when the sounds are limited and muted. Noise seems to clamor for my attention on so many levels that I can’t separate it and focus at the same time. And so mornings were rough when I didn’t have time to acclimate myself to the start of each day. Then my husband’s job changed, his hours were much earlier and in order to capture time together, I got up when he did. 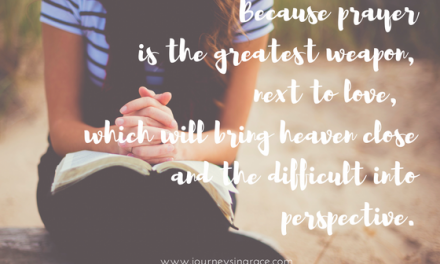 It wasn’t easy, I am slow in the morning and coffee is generally the first thing I think of…but I soon found that the quiet of the morning allowed my mind to ease into the day and my heart to soak up the sweet presence of the Father as I purposed to spend that quiet with Him after seeing my husband off to work. It has been a time that I guard faithfully because it prepares me for the day in a way nothing else ever has. Pausing in the twilight of the day’s beginning plants the seeds for what is to come, seeds of grace in my heart to help me step into this place He has already set before me. This morning as I found myself in the familiar rhythm of the daily attending, I was reminded of Matthew 10 and some Red Letter Words that always make me think about what faithfulness means. As I sit each morning, coffee in hand and quiet surrounding me, I find myself drawn to look beyond where I am sitting…to look out of the window to the world that is waking up with me. 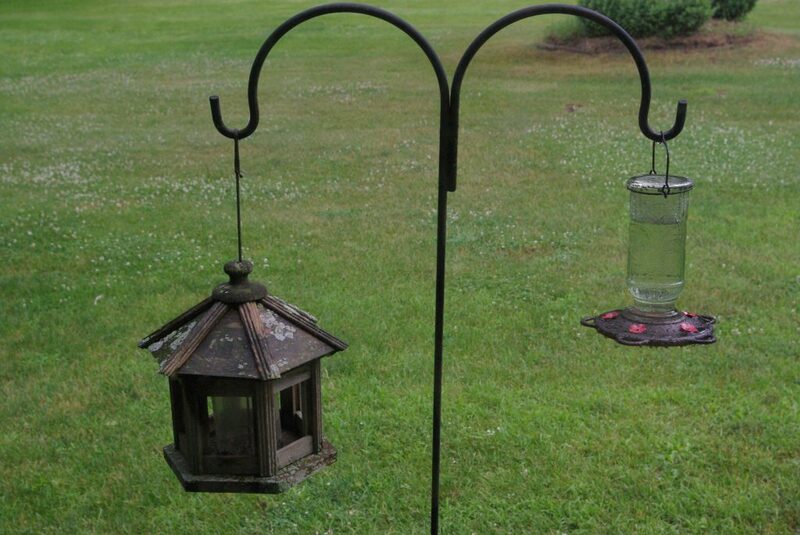 Through the window, directly situated in front of my view, are two bird-feeders. One is full of seed, shaped like a wooden gazebo with open windows to offer the tiny granules that when planted produce more than just one of itself. The other is full of sugary sweet syrup in a vintage glass bottle with red petals to attract the tiny little bird with the rapid fast wings to come and rest. Though I put the food there to draw them in, I am always surprised, always amazed that they come. I am always blessed by the chance to watch their approach, to feel that somehow I have provided for their needs. And though it really is somewhat trivial, the awe that it brings to the morning reminds me of the way God provides for us. His faithfulness is found in His covenant. Faithfulness is a word that we expect to fit our faith, but perhaps seems sometimes out of place. Maybe you have not struggled with this term, but over the years I have found myself asking God to show up and then doubt that He will. 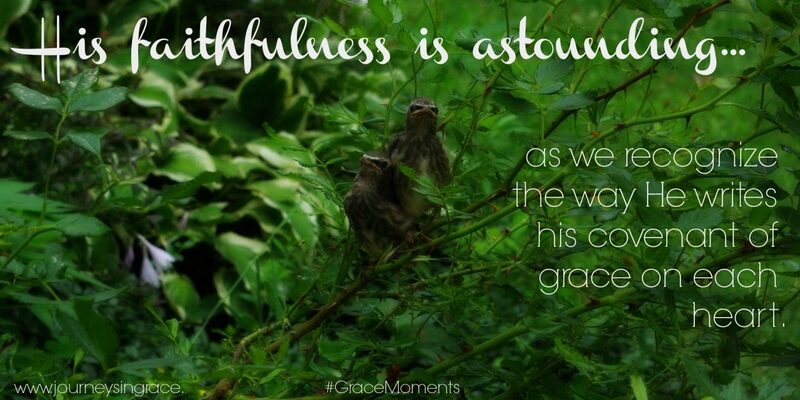 I worry that my own faithlessness will somehow keep me from receiving His grace in those moments. And I let worry steal the peace that trusting Him provides. But His Word reminds me that this covenant He writes upon my heart is one that is not dependent upon me. Andrew Murray calls this covenant one of grace where our hearts are no longer dominated by the law which brings fear and burden, but instead receive a disposition of love from the throne of God extended to us who could never work to deserve it. And if this is true, then why do we allow fear to rob us of the truth that He has so elaborately laid out for us to see. His covenant is eternal, it is an agreement that is made on our behalf with us in mind; it has a purpose of drawing, building and preparing us for our purpose. We are drawn by His Spirit into a place of sacred covenant that has been faithfully prepared by grace. As we are drawn, we are also being built and as we are built, we are being prepared. These lessons are the proof of His seal on our souls, friends. The things that He will do for us because He is who He says He is… because His loving-kindness is immeasurable…because you are worth more than a sparrow. 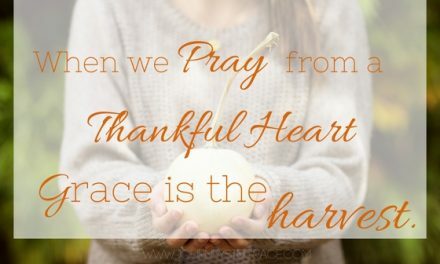 And I am starting to see that while His faithfulness is securely founded upon the truth of who He is, ours is being built as He is writing His Word on our hearts and in the lessons of the every day moments that show how He has already met our needs and satisfied our souls with His steadfast grace. Grace nestles our hearts in the foundation of our faith. Later in the day, I was surprised once again with a reminder of His care for those whom He loves. Nestled in my rose bush were two Cedar Waxwing Nestlings chirping with a fierceness that begged attention. I don’t know how I missed it before, but they were sitting there, right in front of my window so that I had a front row seat. Soon, two adult birds swooped in flapping and flying around them. 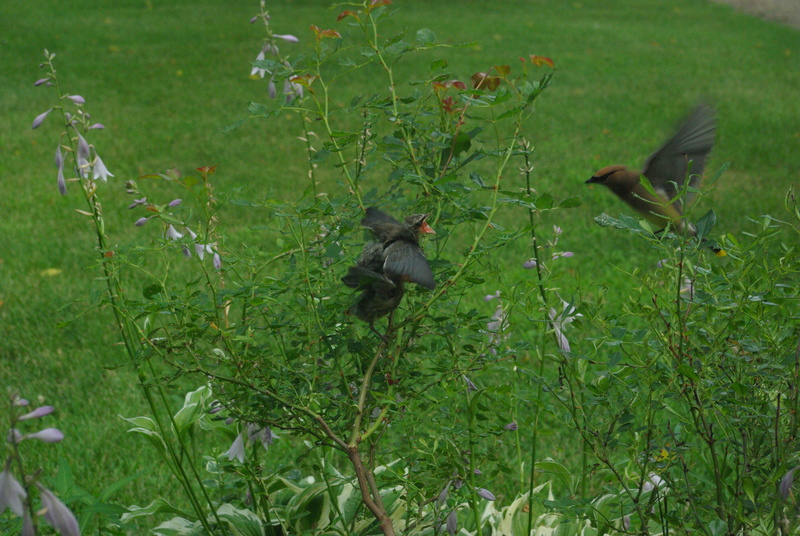 At first it looked like they were feeding them but they were really coaxing them to fly. The adults would swoop in, encourage the young birds by showing them what to do and then leave to a branch nearby in order to watch them. This actually took most of the afternoon and I was mesmerized with the show. One of the birds seemed to find the courage to get off the branch. The whole time the adult birds were never far from the smaller bird, always within viewing distance. 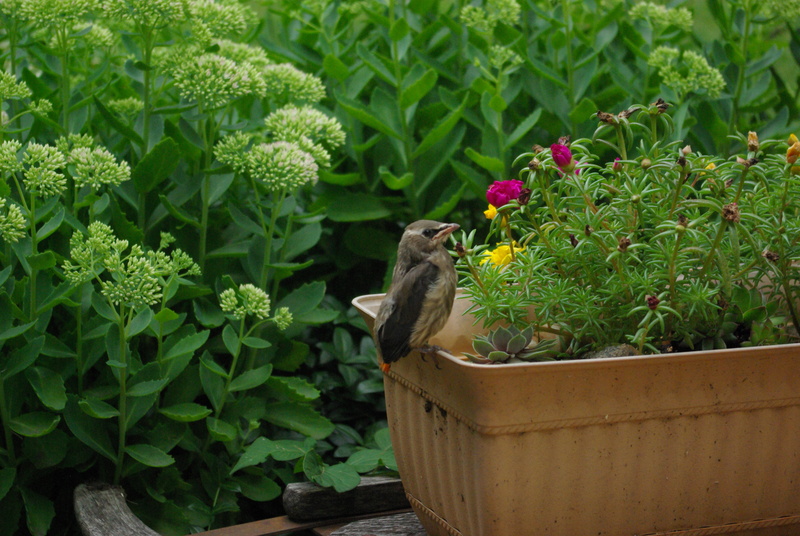 The other nestling fell off and, in the end, didn’t make it, it broke my heart to watch it play out like that. My kids and I would come and go from the window till all at once, the bird was gone but the lesson was not missed on me today. We are always hoping for a happy ending, aren’t we? And still, no matter what the ending, God is always faithful to meet us right where we are, swooping in and encouraging us follow His example and fly strong. God is faithful, friends. He has established a covenant of grace with the very hearts where He has also written His Word so that we can know Him. And he gives us moments where we are in awe of the remarkable way He cares for all of His creation so that we can remember that He is often always swooping and watching over us, urging us to step out in faith and to spread our wings and fly without fear or hesitation. 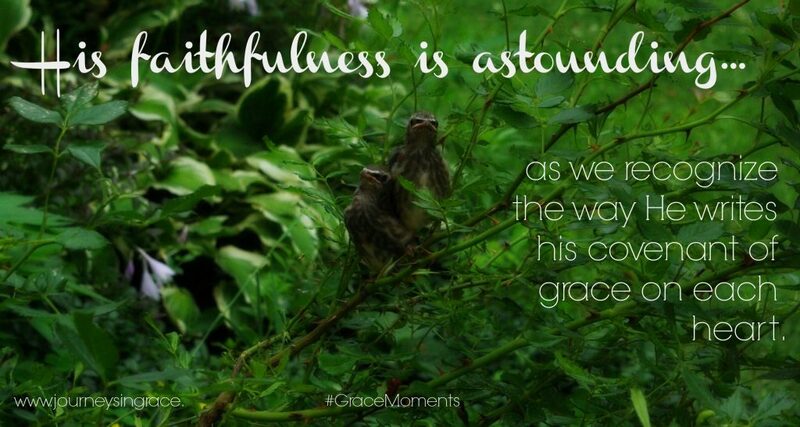 What are some ways that you are recording #GraceMoments in His faithfulness friends? In a week where hearts broke over the faithless acts of those who were hurting, I needed this reminder of His faithfulness in the lesson of the waxwing and the miracle of faith displayed by His covenant of grace. Another special way He revealed His constancy in our lives happened when daughter took a step of faith and hit publish on her first blog post. I am really proud of her courage with this since communication has not always been easy for her. She is writing about a topic that has been hard to discuss as she is sharing her journey through a diagnosis of epilepsy and her hope to make a difference in others lives through her words. This girl, she has fought hard for a chance to share her faith and God He has met her every step of the way. It didn’t always feel like we were walking strong in this faith journey, but His love never wavered. You can find her story and her words over at her new blog, www.journeysinfaithfulness.wordpress.com. 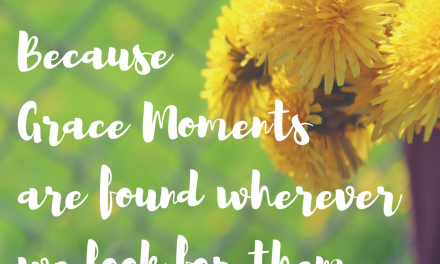 Praying for your week to be full of those miracle moments that make you pause and recognize His faithfulness, the #gracemoments that we need to record and remember, because His covenant of grace is a promise and a steadfast hope we can count on. I am grateful for God’s Faithfulness through His covenant…even in weakness, He remains a Faithful God. Thank you so much for the encouragement you left on my blog earlier. It means a lot that you stop by and hug me virtually through your kindness. Dawn, this is just beautiful and offers much hope. A beautiful reminder that He is faithful to His covenant to each one of us. Blessings!